Introduce yourself to the driver as an Associate Member for a personalised visit. 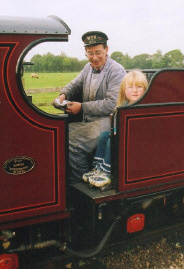 Footplate rides may be offered (subject to local railway regulations). The Associate Membership annual fee is �10. 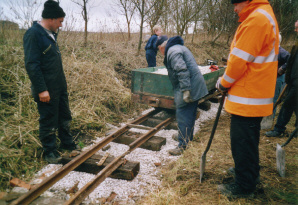 Any surplus goes towards SPG funds for future work such as new driving wheel tyres and a new boiler, which we will eventually need. Associate Membership is available for anyone with an interest in Si�n who wishes to be kept up to date with our news and take part in group events. Associate Members receive three newsletters a year, reductions on training courses and invitations to group events. 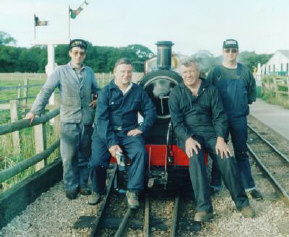 These take various forms from social events, like barbeques or railway visits, to working parties, such as loco or track weekends, or when Si�n runs on other railways as a visiting engine. If you would like to join, please fill in the details by clicking here, printing the form, and sending to Felicity Fuller with your membership fee. We look forward to welcoming you as an Associate Member � a friend of Si�n. N.B. Associate Members do not have ownership or access rights. Associate Members are not liable for the group, or its running costs, and are not entitled to attend or vote at any meeting where business transactions take place.